Nokia’s new E6 and X7 models do not include NFC chips, the company has told NFC World, confirming concerns that it would retreat from its plan to include the technology in all new Symbian phones. Finnish mobile phone giant Nokia has confirmed to NFC World that the new E6 and X7 Symbian smartphones it announced last week do not include NFC technology. Anssi Vanjoki, then Nokia’s executive vice president for markets, told delegates at an industry meeting in June last year that all new smartphones would come with NFC from 2011. The company later clarified this, saying first that only Symbian smartphones would come with NFC and then adding that Meego devices would also include NFC technology. February 2011’s deal between Nokia and Microsoft, however, led to concerns that the Finnish phone maker would step back from this commitment and that now seems to be the case. As well as the lack of NFC in the new E6 and X7 phones, a date for switching on the NFC functionality in the Nokia C7, launched in October 2010, is also still to be set — although the Nokia Astound, a renamed C7 for T-Mobile USA, will have NFC capabilities from day one. Nokia’s politics going back and forth is really painfull. Is there any strategy behind this? It will be turned on in the next fw-update aka Anna. 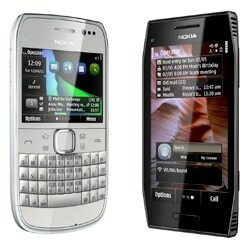 Is Nokia still reliable in performance and price?